Wolverhampton Wolves Speedway: WOLVES WIN AGAIN! The Parrys International Wolves put in another eye-opening performance on their travels after defeating Coventry at Brandon in their season-opener last month. It was a fine all-around team showing from the Monmore men as they led from the outset before narrowly missing out on all four Elite League points in the final race. The result moves Wolves up to third in the table with seven points out of a possible eight despite having yet to race a home meeting - and promoter Chris Van Straaten was delighted with another magnificent display. "We are very pleased with the result," Van Straaten said. "We had a very strong start this evening which I think set the tone and rattled the Robins a little bit. "We were passing quite well throughout the meeting which is very encouraging, and there is a good spirit within the side. "Any rider can hop out and win a race and nobody is surprised. They are all very capable and I think that's the sign of a good team." Skipper Freddie Lindgren top scored for the second successive meeting with a classy 10 point haul, whilst Aussie ace Sam Masters went unbeaten in his opening three rides to help put them in the driving seat. Kyle Howarth also notched paid double figures against his former club, whilst Jacob Thorssell added two vital race wins with an impressive performance in the No.3 spot. 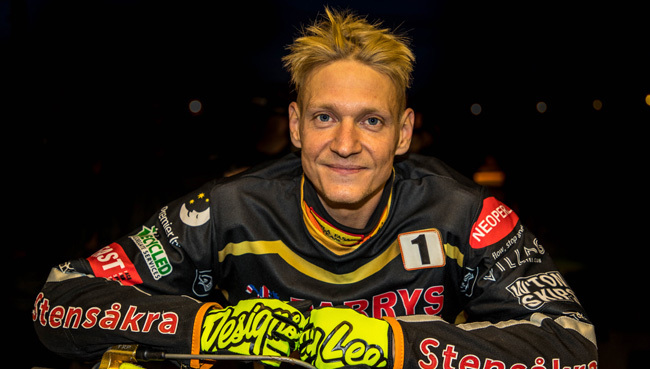 Fellow heat-leaders Joonas Kylmakorpi and Mikkel Bech contributed a heat win apiece with solid showings whilst local lad Ashley Morris chipped in with a vital paid four as he stepped in for Max Clegg at reserve. The in-form Wolves will be back in action on Monday as they finally host their home opener against Lakeside at Monmore Green (7.30). SWINDON 44: Charles Wright 15+2, Jason Doyle 14, Josh Grajczonek 8+1, Nick Morris 4, Justin Sedgmen 2, Stefan Nielsen 1+1, Rohan Tungate 0. WOLVERHAMPTON 48: Freddie Lindgren 10, Kyle Howarth 9+1, Sam Masters 8+1, Jacob Thorssell 7+1, Joonas Kylmakorpi 6+1, Mikkel Bech 6, Ashley Morris 2+2.